A. A tiny, remote town, named Fish Camp, where veteran Walter Cruz ( Stephan James ) dreamed of relocating, to get away from it all. A. There actually is a place called Fish Camp, located in northern California, near the entrance to Yosemite National Park. But it only has 59 residents , so I don't know if you could actually call it a town. From what I can tell, it seems to be a Yosemite-related vacation spot, and consists mainly of cabin rentals, bed & breakfasts, and a large Tenaya Lodge hotel. But from the photos I've seenof Fish Camp online, it does look very much like the wooded, mountainous area we see on the show. So the location scouts did their job well, in reproducing the general look. A. We hear about Fish Camp early on, but we don't see it until the last half of the final episode. In Episode 3 ("Optics"), At 13:46, we listen to a counseling session between Heidi and Walter, in which Walter is trying to describe his relationship with fellow veteran Joe Shrier, by comparing it to an overlong road trip, in which two people spent too much time together. As they talk about an imaginary, 3000-mile road trip, the name "Yosemite" is dropped, but the name "Fish Camp" isn't mentioned. However, in the final Episode 10 ("Stop"), we see a flashback of Heidi & Walter, again in a counseling session, but in a more playful, flirty mood, as they return to that road trip topic. This time, they daydream / plan an impractical, fantasy road trip in which they escape together to Fish Camp ( or some remote place like it ), and joke about how they could get by panning for gold. As they kick around ideas for the imaginary trip, they describe their idealized town, where they would settle down, as being "Up somewhere around Yosemite", and as having only a "gas station, hardware store, little café…", and as being "Up in the mountains by the creek… One stoplight, that's it." But we don't actually see Fish Camp until the latter half of Episode 10, when Heidi, looking for the missing Walter, realizes that he might have finally taken that lengthy road trip they daydreamed about. 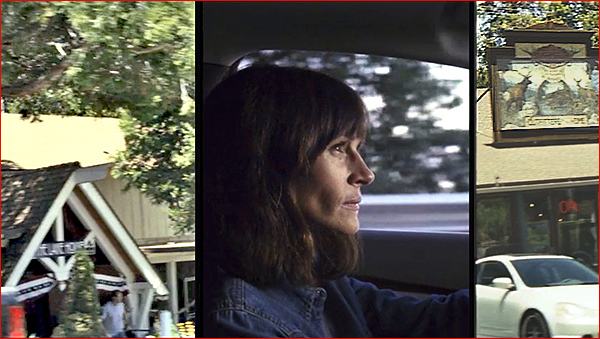 So, with Walter's road map in hand, she heads out following the same route, hoping to find him. The camera then follows her journey west. At first, we simply see a few shots of the small towns and forested regions as she drives through, studying Walter's map, looking for clues. We see quick glimpses of a few storefronts, and a post office, enough to let us know that she is up in the mountains, searching for him. Then finally, at 26:43, we see a large red stop sign, and the camera pulls back to show that Heidi has arrived in a small mountain village. Later, we see more of the town of Fish Camp, including the aforementioned "hardware store and little café". 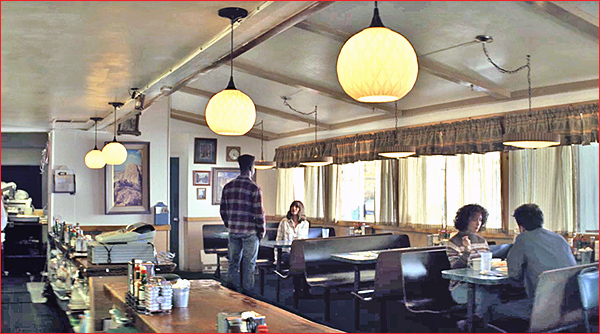 But I've done a separate page about that neighborhood diner (and the adjacent hardware store), so this page will focus solely on those earlier shots of her road trip to Fish Camp that lead up to her encounter with Walter in the diner. A. No, this is not the actual Fish Camp, CA. This is not even northern California. A. These mountain road trip scenes were shot in the Lake Arrowhead area. Or more specifically, the mountain resort communities between Lake Arrowhead and Big Bear Lake, up in ski country in the San Bernardino mountains that tower above Los Angeles to the northeast. 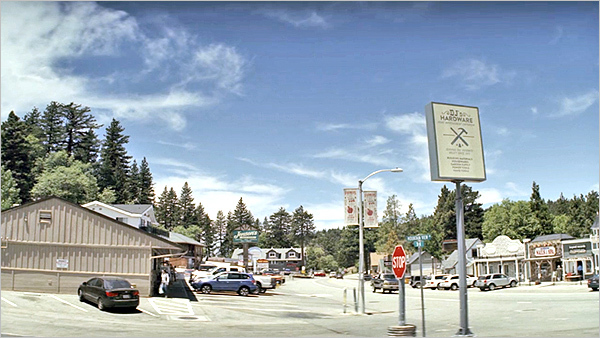 Most of the key filming locations for this finale were shot in Running Springs, California, a small mountain town with a population of about 5,000. That includes the initial view of "Fish Camp", as Heidi arrives there for the first time, and stops at stop sign. But they shot the earlier road trip scenes a few miles away, in an area known as Cedar Glen, a community of 550 people , located about four miles northwest of Running Springs, and just east of Lake Arrowhead. 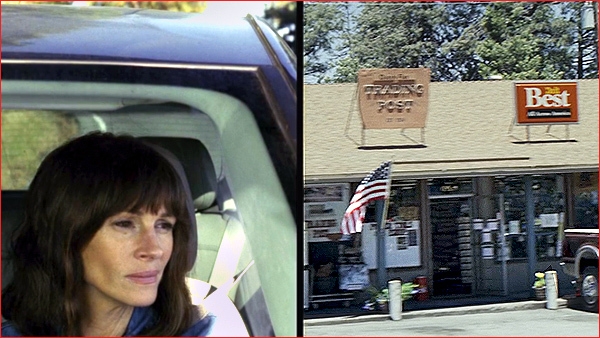 Along the way, we see the three spots that Heidi and Walter mentioned during the counseling sessions: a gas station, a hardware store, and a little café – along with a post office, and miscellaneous rustic shops. 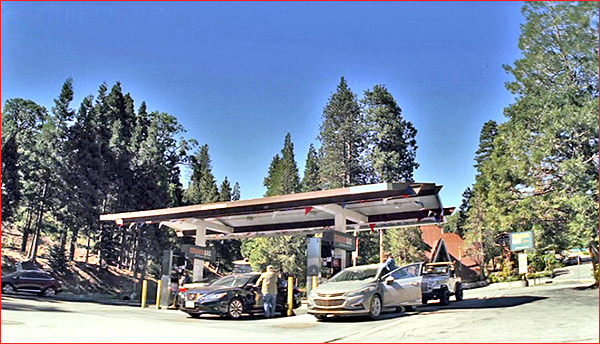 In real life, this is the Cedar Glen Gas Stop, located at 231 N. CA-173, just outside Lake Arrowhead, CA. It's at the corner of CA-173 and Hook Creek Road. In real life, this is the Cedar Station Antiques store, located in a former 1940's gas station ( but not the same gas station that we saw earlier ). It's address is 28930 Hook Creek Road, in Cedar Glen / Lake Arrowhead. 25:57: The next quick shot is of a rural post office. A small sign says "Dutch Flat", which is a tiny former gold-mining town about 130 miles north of the real Fish Camp, in Northern California. But that sign is fake. 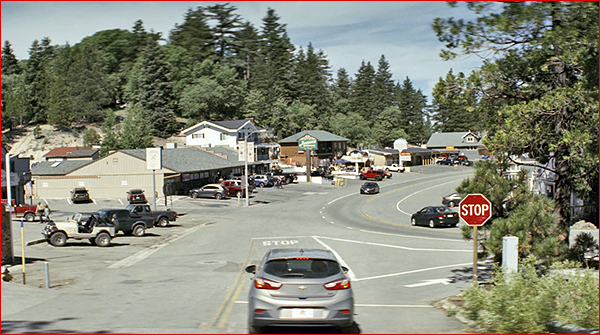 In real life, that Post Office sign reads "Cedar Glen". 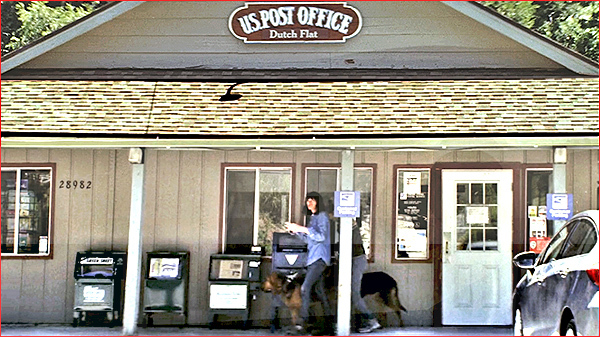 This is a real U.S. Post Office, located at 28982 Hook Creek Road, in Cedar Glen, CA. It is just east of (about 300 feet from) Cedar Station Antiques. This store, with the red "Do it Best" sign, is the "Cedar Glen Trading Post & Hardware", at 28946 Hook Creek Road. It's located in that same Cedar Glen collection of shops, in between the antique store and the Post Office. That shop with the painting on the roof is "The Lake House" (antiques and furnishings), and can be found just to the right of the Trading Post, at 28930 Hook Creek Road, Cedar Glen, CA . And that is the last shot from Cedar Glen. 26:43: Heidi's arrival in Fish Camp. That first view, when Heidi stops at the stop sign, is a view of Running Springs. We are looking west down Holiday Lane / Hilltop Blvd, (around 32000 Holiday Lane), where Holiday Lane ends and turns into Hilltop Blvd. It's near a three-way intersection of CA-18, Holiday Lane and Hilltop Blvd. ...as we see the parking lot of D.J. 's hardware and "the little cafe". But I've created a separate page for those two important locations, heading into the final scene. A. Fortunately, I had found out earlier about the location of Walter's diner (click here to read the details), and knew it was in Running Springs. So, I guessed that they probably shot most of their Fish Camp mountain scenes up in the same general vicinity. 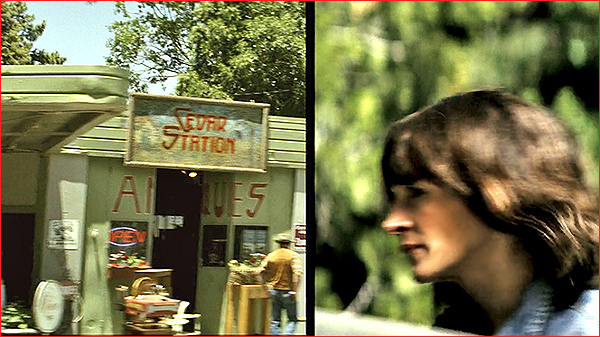 As for finding the locations in Cedar Glen, the key there was the sign reading "Cedar Station". Googling that turned up the address of that Cedar Station Antiques shop. Once I found that address, it was a simple matter of looking around (via StreetView) to spot the other Cedar Glen locations, which were all bunched together within a block of each other.